Are you moving to Boston from another part of the country or moving out of Boston and relocating to a city in a different state? Either way, you will need a trusted long distance moving company by your side to help your move go smoothly. TLC Moving is an interstate moving company that has the experience and equipment necessary to assist you with your move. 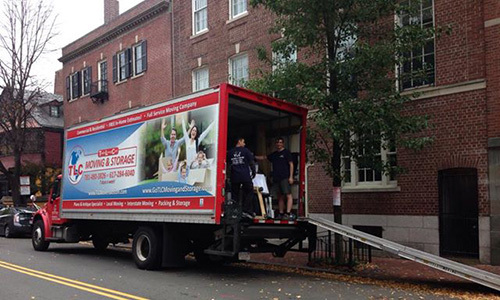 All your belongings will arrive safely at your destination when you work with the long-distance Boston movers at TLC Moving, and you won’t have to worry about encountering any logistical nightmares along the way. Packing your entire life into the back of a truck and taking it across state lines to your new home can present a long list of challenges. From making sure everything is accounted for when you leave your old home to ensuring that your personal belongings are safe while you’re in transit, TLC Moving has interstate movers that can take care of everything. We have plenty of experience serving as interstate movers and can relocate your household goods anywhere throughout the lower 48 states and Washington, D.C. Our long-distance Boston movers will prove to be professional, and we will do everything in our power to avoid running into roadblocks during your interstate move. In addition to providing you with reliable and trustworthy interstate movers, TLC Moving will also set you up with the most affordable rates in the industry. As the leading long distance moving company in Boston, we base our rates on the distance we travel while transporting your items as well as the actual weight of your shipment. As required by the U.S. Department of Transportation, which regulates every interstate moving company in the country, we also offer basic insurance coverage of $0.60 per pound for our long-distance shipments. Additionally, you will have the option of obtaining other types of insurance coverage either through TLC Moving or through your own insurance company. In order to make your long distance move successful, you need to work with an interstate moving company you can count on. Call TLC Moving at 617-284-6040 today to learn more about how our interstate moving services can benefit you. Our attention to detail sets us apart from other local, interstate and long distance movers. We also offer interstate flat rate moves. If you have questions about your interstate move, you can speak with a live Interstate Moving Specialist at 781-480-3826 request a Free Estimate or e-mail TLC Moving & Storage. Long and short term storage. Guaranteed pick up and delivery dates. Got a question? TLC Moving and Storage is here to help. Please call our office Monday through Saturday 8am to 6pm Eastern Time.